﻿Earn your CLVS this spring — Your first step is online! Start now and you can earn your Certified Legal Video Specialist (CLVS) certification this spring. The process for earning the CLVS includes three steps: 1) completing the educational training, consisting of a mandatory online workshop and an optional hands-on training session; 2) passing a hands-on test of what you’ve learned in a simulated deposition; and 3) passing a written knowledge test. 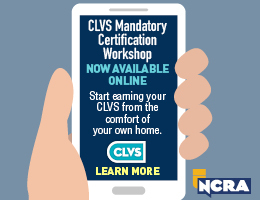 The first step is to complete the CLVS Mandatory Certification Workshop, which is available online. The Workshop includes an introduction and nine modules covering everything you need to know to be prepared to record a deposition with confidence. The materials include a review of the equipment needed, ethical considerations, how to work with the court reporter, and much more. The online component includes all of the information you need to complete the mandatory educational portion of the CLVS certification. The second part of the educational component is an optional Hands-on Training, which is scheduled in conjunction with this spring’s CLVS Production Exam. During the hands-on session, CLVS candidates have the opportunity to go over the practical test, participate in a mock deposition, and gain valuable experience with the camera they will be using in the test. In March, registration will open for both the Production Exam and Hands-on Training, which are scheduled for April 5-6, at NCRA’s headquarters in Reston, Va. Space is limited so candidates are encouraged to sign up early. Registration closes on March 22. For the Production Exam, candidates will run the show at a staged deposition and be graded on their ability to follow video deposition guidelines and to produce a usable, high-quality video of the deposition. Candidates must have taken the online CLVS Mandatory Certification Workshop, available online through InReach, prior to taking either the Production Exam or the Written Knowledge Test. Candidates must complete the educational components prior to taking the CLVS Production Exam. Candidates can take the CLVS WKT in January, April, July, and October each year. Registration for the Written Knowledge Test for the CLVS will next open in March. Register for a test by March 31 and schedule your test between April 9-23 to complete the three-step process, and you will be well on your way to earning the CLVS. To learn more about the CLVS program, visit NCRA.org/CLVS. NCRA members who hold another credential, such as the RPR, can earn 0.25 PDC each after passing the CLVS Written Knowledge Test and the CLVS Production Exam. Please contact NCRA by calling 800-272-6272 or email testing@ncra.org for more information. NCRA offers members many different ways to invest in their futures, support the profession, and thrive in their careers. According to NCRA’s 2017 Member Needs Survey, members join NCRA for many reasons, including gaining access to national credentials, supporting the profession, and connecting with a national organization. If you want to get the most out of your membership, consider how NCRA benefits you. Clients, employers, and peers know that people connected to a professional organization are more likely to know about and adhere to industry standards, ethical codes, and current policies — and NCRA members are the same in this regard. By being a part of the NCRA community of professionals, your clients, employers, and professional colleagues understand that you have made a commitment to your career and have a stake in maintaining the standards of the profession. Be proud of your commitment. 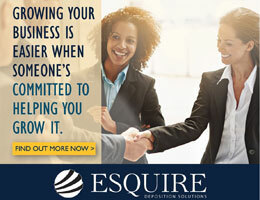 Maximize your professional investment by marketing your achievements and membership. Did you know that NCRA offers a distinct NCRA member logo for use by NCRA members? You can include the NCRA member logo on your advertising, business, and other similar promotional materials as a way to denote your membership in the Association. The NCRA member logo can only be used to designate individual membership, as only individuals can be members, and should not be used by companies or firms or in a way that implies a company is a member. The NCRA member logo is not the same as the NCRA logo. If you are currently using the NCRA logo, please seek permission to use it, remove it from your materials, or consider whether the NCRA member logo would serve your purposes. More information about how members can use the NCRA member logo is part of NCRA’s Procedures & Policy Manual, which is available on NCRA.org. To access the most current version of the NCRA member logo, visit NCRA.org/Logos. NCRA members who have earned an NCRA certification may use the certification or its abbreviation in their marketing materials as long as they maintain CEUs and pay annual dues. Be sure to enhance your marketing materials and website with your NCRA member and credential logos. According to Chase Cost Management, workers in the legal professions spend an average of $1,000 per person per year on office supplies. That is a lot of folders, pens, and sticky notes. If those figures hold true for the professions of court reporting and captioning, NCRA members can easily recoup their annual NCRA membership dues just by taking advantage of the discounts available from Office Depot through the NCRA Saving Center. NCRA Saving Center discounts at Office Depot provide members with savings up to 80 percent off office essentials. Some recent deals include expanding file folders that cost only 70 cents each. That’s a savings of $2.80 each. If you bought 100 file folders, you could recoup the cost of your NCRA membership in file-folder savings alone. Of course, other types of office supplies are available at discounted rates. To sign up for this benefit that is included in your NCRA membership, visit NCRA.savingcenter.net. Other discounts available to NCRA members through the NCRA Saving Center include accounting and payroll services, access to a collection agency, credit card processing services, and discounts on entertainment deals, car rental fees, and access to telemedicine, health insurance, and prescription drugs. Through NCRA social media pages, through NCRA events, and through JCR stories about members across the country and around the world, you learn more about what is going on in the profession and how your colleagues take on problems. NCRA members take to NCRA’s official Facebook groups to pose questions and offer solutions on day-to-day challenges, offer support for bad days and congratulations for milestones, and share the latest news affecting the professions. NCRA events offer informative presentations and inspiring speakers to break you out of the everyday grind and help you take the next step for you. NCRA’s publications give you nuggets of wisdom from other professionals that can help you build your career. No matter how you learn, we’ve got you covered. 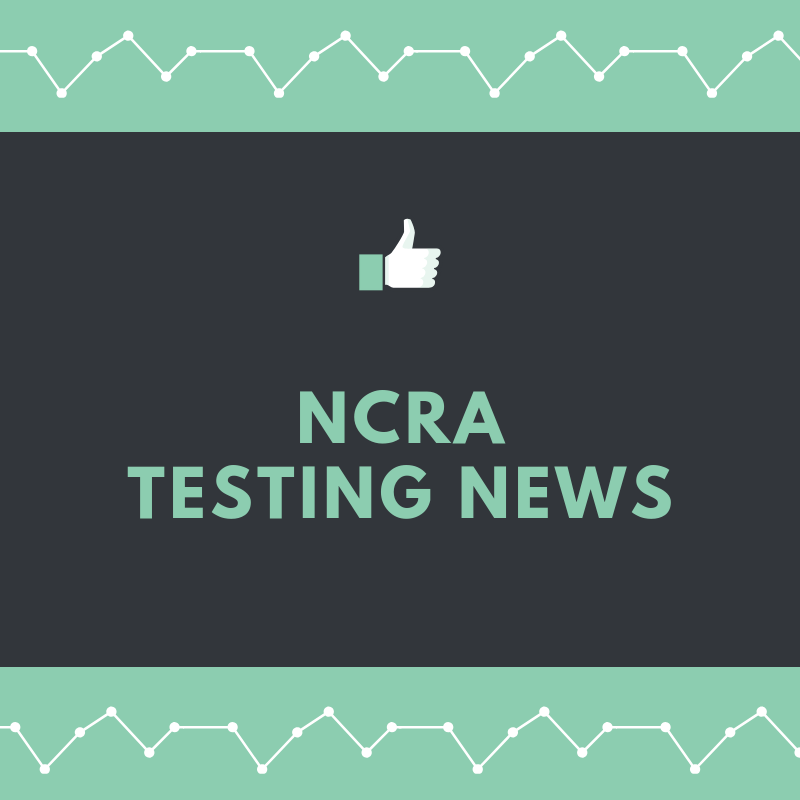 NCRA, in conjunction with Realtime Coach, offers a series of both videos and articles on the ins and outs of online testing. These videos and articles aid in preparing candidates for successful online skills testing. Your NCRA certification identifies you as a person interested in self-improvement, a career-minded individual, and a member of the professional community. NCRA offers several ways to earn Continuing Education Units (CEUs) that offer the information you can use in your career, whether you are an official, freelancer, business owner, captioner, or legal videographer. 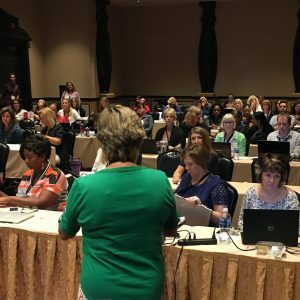 From the inclusive and collaborative NCRA Firm Owners Executive Conference for independent contractors, small agency owners, and large firm executives to the annual NCRA Convention & Expo for everyone; and from live webinars to many series of e-seminars that you can access whenever and wherever you choose, NCRA’s extensive library has you covered. Your NCRA membership offers so much more than you might think — from member-exclusive discounts to networking opportunities to career-enhancing certifications. Is your membership up-to-date? Check your membership and profile information, including your email address, so you don’t miss announcements and news from NCRA. 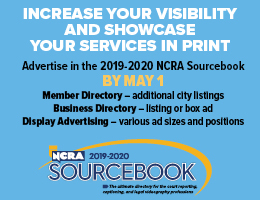 Visit NCRA.org to update your profile by April 15 and be listed in the printed 2018-2019 Sourcebook. Contact membership@ncra.org with questions. Changes to NCRA’s Continuing Education Program rules by the Association’s Council of the Academy of Professional Reporters (CAPR) will take effect Oct. 1. The changes were made after a several-month review by CAPR to update the current policies and procedures. While many of the sections remain unchanged, the revisions broaden the scope of topics for captioners and encourage all members to obtain preapproval from NCRA or CAPR before they attend seminars with third-party vendors for CEUs. “CAPR felt strongly that the eligibility of topics for CEUs was geared more towards judicial reporting and not captioning. We reviewed these areas with the idea of broadening the scope in order to include more topics that captioners would come across in their work,” explained CAPR Chair Mary Daniel, FAPR, RDR, CRR, CRC, a freelance reporter from Las Vegas, Nev.
“CAPR also wanted to encourage reporters who are relying on approval of CEUs for their certifications to obtain approval from NCRA or CAPR before they attend the seminar. This was due to many last-minute requests for approval. When CAPR denies the CEUs, the reporter is then faced with the dilemma of obtaining CEUs before their cycle expires. Hopefully, the changes in the rules will give reporters and captioners a better sense of what will and will not be accepted for CEUs and the timelines they are facing,” she noted. The Continuing Education Program Rules apply to both continuing-education activity sponsors seeking preapproval of those activities as well as to individuals seeking to claim CEUs from NCRA for non-preapproved activities. “It is important for CAPR to regularly review the continuing education rules in order to keep current with the needs of our members. This publication and notification is in keeping with our accreditation requirements with the Accrediting Council for Continuing Education and Training (ACCET), which will conduct our five-year recertification visit early next year,” said NCRA Senior Director of Education and Certification Cynthia Bruce Andrews. 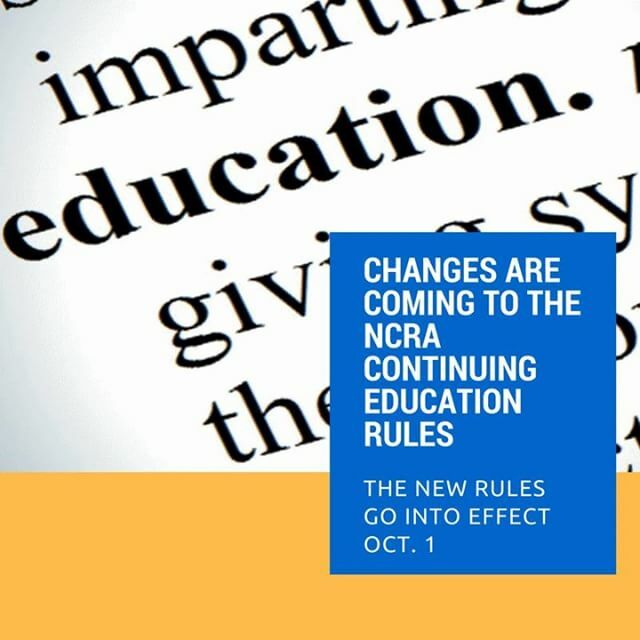 The revised handbook is available on NCRA’s website and changes to the rules are highlighted in yellow. The goal of continuing education for NCRA is to equip credential holders with the knowledge and skills necessary to compete in a world of ever-changing information and technology. A uniformly applied Continuing Education Program ensures that clients will experience a consistently high level of quality, proficiency, and knowledge among NCRA credential holders. The body of knowledge in the world changes approximately every seven years. In this spiraling explosion of information, NCRA credential holders must keep abreast of new developments or face being left behind. The obvious benefits of continuing education are learning new skills, keeping up with technological advances, and developing new areas of expertise. However, the hidden benefits may be even more valuable — keeping the mind open to new ideas, honing the skills of learning, and developing as a well-rounded professional. The Fresno Bee reported on Nov. 21 that NCRA member Sandy Edmonson, RDR, CRR, CRC, from Hanford, Calif., recently earned the Registered Diplomate Reporter certification. The article was generated by a press release issued on her behalf by NCRA. The Sidney Herald reported on Nov. 21 that NCRA member Emily Niles, RMR, CRR, CRC, from Bozeman, Mont., recently earned the Certified Realtime Captioner certification. The article was generated by a press release issued on her behalf by NCRA. Do you remember the day you learned that you passed your RPR certification exam? I distinctly remember when I found out — Christmas Eve. I had taken the test in November of 1989. Every day I would come home from work and ask my husband, Bob, if I had gotten the results. Each time the answer was no. Unbeknownst to me, he had placed the results — unopened — in a wrapped box under the Christmas tree. It could have ended very badly had I not received positive news. He is a very blessed man. Passing the RPR meant I passed muster and might be able to succeed in court reporting after all. Those credentials represented a lot to me then, and they still do to this day. The other professionals in my national association had given me their imprimatur, and I gleefully joined their ranks as a professional registered member. Several years have passed since those early days, and I know that I would not be where I am today without the help of mentors and reporters sharing their experiences along the way. Those mentors and reporters began giving advice and encouragement from day one, and it has not stopped. I am lucky to have been surrounded by such a fantastic group of dedicated professionals. We all have anecdotes of the valuable knowledge that others have passed along to us. To illustrate one such story and the long-term impact of a simple act, when I was a newly graduated reporter in 1987, Jean Long, RPR, graciously shared with me a medical term. She had spent some time looking for the proper spelling at one point in her career; the term was bruit. It is pronounced BREW-EE. She walked me over to the dictionary to point it out. I never forgot her short one-minute lesson. A couple of years later, at a different court reporting agency, another reporter was struggling to find that exact word. I knew it immediately — not from school days, but from Jean’s lesson. It was time to pay it forward, and I proudly did. After gaining some real-life experience and much-needed confidence, I came to the realization that it was not enough to be a contented dues-paying member in my professional associations. I wanted to do more. I had observed others volunteering and felt that I could offer perhaps a slightly different approach. It was time — time to repay all those gifts of knowledge and information that were so readily shared with me. I had received so many over the years. I started out small. Volunteering was out of my comfort zone, and I truly wanted to be brave and emulate some of the best professionals in our business. The first time I volunteered for my state association was in 2002. We had a need to represent the court reporting profession at the All-Ohio High School Counselors Conference in Columbus. With another reporter, Lori Jay, RPR, CMRS, we were responsible for promoting the court reporting and captioning career choices to the school counselors who approached our table of brochures and equipment. Donna Karoscik, RDR, CRR, CRC, provided a demonstration of realtime to the group by captioning the keynote speaker. We were enthusiastic, and we worked hard that day to advocate for our profession. After that experience, I began helping my state association with administering the national certification exams, first as someone to assist and then as a chief examiner for the CRR tests. I tried to be the voice of calm for test candidates, and I enjoyed seeing the test candidates succeed. I also began assisting my state association at the Ohio Judicial Conference’s Court Technology Conference. With many vendors present touting their “technology,” it was an eye-opening experience. I now know just how crucial it is for court reporting associations to be represented at such events — and displaying the best we have to offer in court reporting and realtime technology. My state association members attend this event year after year without fail. Fast forward a few years. Our state association needed members willing to serve on the board. After some persuasive discussion by Sue Terry, FAPR, RPR, CRR, CRC, and a multitude of excuses on my end, I agreed to serve on the Board of Directors of the Ohio Court Reporters Association (OCRA). I came in as vice president and moved my way up the ladder. It was at that point that I began to understand the intricacies of leading, the minefields — some of which cannot be avoided — and the heavy lifting that volunteering involved. My prior volunteer experiences were rewarding but nowhere near as challenging. The successes were amazing; the failures devastating. I was working as an official court reporter in state court during this time. My court administration seemed enamored with digital recording technology and eagerly proclaimed the cost savings to be realized to any who would listen. It appeared to be an uphill and frustrating battle. Through the efforts of the late Jerry Kelley and other volunteers across the country, I quietly began to amass a database of current electronic and digital recording failures. It was an informal, unsanctioned effort, but the group saw a need. The database effort seemed a tad futile at times, but I can attest that the information gathered was useful at a key moment during my tenure on the OCRA board, particularly when the Cleveland Plain Dealer came calling for commentary on an article regarding the court reporter versus electronic and digital recording debate. That volunteer effort provided relevant, documented cases to cite, not just hearsay or conjecture. It was a small victory. Coincidentally, it was around this point that Stephen Zinone, RPR, reached out to me about serving on the NCRA Cost Comparison Task Force. Our task was to do a complete analysis of the cost of digital recording technology versus a court reporter — using best practices for each. To say this was right up my alley is an understatement. Steve was a thoughtful, smart leader who asked for input from all of us. The entire group worked hard to make the Task Force’s white paper bulletproof. We accomplished our goal, though it took many emails, conference calls, an in-person meeting in Nashville, and a couple of years of persistence. To this day, when OCRA members attend the Ohio Judicial Conference’s Court Technology Conference, we have the white paper there to discuss with attendees. That first experience serving as a task force volunteer at the national level gave me a huge sense of fulfillment. I was proud of our work, and I was hooked. I knew I could make a difference — if not for myself, perhaps for others. Working with students as an adjunct faculty member for Clark State Community College is something I enjoy immensely, so signing up to work on the Item Writing Committee seemed a natural fit. Brenda Fauber, FAPR, RDR, CRR, CPE, served as the chairperson of the committee. The group met in the Washington, D.C., area. We spent time training with a professional consultant, and we discussed at length what is involved in writing proper written knowledge test questions using approved authoritative sources. (Yes, there is a question involving bruit — in case you were wondering. I’m paying it forward.) I continue to serve on the committee; along the way, I have begun serving on the Skills Test Writing Committee. What an education I have received! I have gained a deeper appreciation of our national certification tests and the incredible vision of those who saw the necessity of certification. I have learned why, as a professional association, we must continually strive to ensure that the certifications are valid and fair measures of both the entry-level reporter and the seasoned reporter. Those who pass the NCRA certification tests can be confident that they, too, pass muster and have indeed earned a worthwhile achievement. Comedian Lily Tomlin once stated, “I always wondered why somebody doesn’t do something about that. Then I realized I was somebody.” This applies to each one of us. Let me ask: Who is better than those of us who are in the trenches to represent and understand the issues we, as a profession, face? Who is going to do the heavy lifting and advocating for our profession if we are not willing to step up and do it for ourselves? Together, we can make a difference. 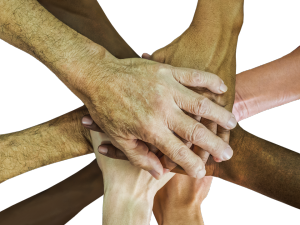 The value of volunteer work benefits your professional associations and you. I could enumerate a variety of reasons to volunteer, but you know many of them already. Think about this: You make time for what matters to you. My profession matters to me. I sincerely hope it matters to you. We need you. We need more than your dues. We need your participation. We need your voice. We need your input and ideas. We need you at all levels, whether it is state or national. I urge you to be brave. Volunteer. I volunteer to give back to a profession that I love. I volunteer to pay it forward and to thank those along the way who reached out a helping hand, gave me a word of advice, offered reassurance, and sometimes provided a swift kick in the rear or a shoulder to cry on. Volunteering is my way of saying thanks for making sure I passed muster, to thank those who came before me and those who will continue long after me. Thank you for being there. Allison A. Kimmel, RDR, CRR, CRC, works as a reporter in the United States District Court, Southern District of Ohio, and as an adjunct faculty member for the court reporting and captioning program at Clark State Community College. At the NCRA Convention & Expo in Las Vegas, the Certified Realtime Captioner (CRC) Certification Committee hosted the third annual CRC Workshop. For one-and-a-half days, six members of the CRC Committee taught 68 registrants both beginning and advanced lessons regarding broadcast and CART captioning. The Written Knowledge Test was offered immediately following the workshop. The CRC Workshop is one of three requirements of the CRC program, along with a Written Knowledge Test and a Skills Test. NCRA members are seeing more and more requests from clients that captioners hold national certifications, and many of these clients want to see copies of certifications. This demand comes from local governments, educational institutions, and judicial systems that need to meet ADA requests from the public. Instructors Heidi Thomas, FAPR, RDR, CRR, CRC; Deanna Baker, FAPR, RMR; Karyn Menck, RDR, CRR, CRC; LeAnn Hibler, RMR, CRR, CRC; Stacey Potenza, CRC; and myself had way too much fun sharing our decades of experience in the captioning world. Our collective experience covers broadcast, education, theater, sports, stadium, high-tech, business, and web-based captioning. The purpose of the CRC Workshop is to provide both beginning and experienced captioners exposure to all aspects of this exciting field. 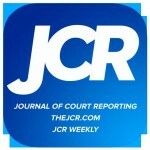 Even though captioning is a well-established field, it is still relatively young compared to court reporting. Some captioners may be well versed in local news captioning and know nothing about educational or religious captioning, and vice versa. Since the first CRC Workshop in New York City in 2015, the number of attendees has increased each year. This year, the increase was influenced by the Dec. 31, 2017, deadline for a large group of Certified Realtime Reporter (CRR) holders. Members who passed the CRR Skills Test before Nov. 1, 2011, can earn the CRC by attending the CRC Workshop and passing the Written Knowledge Test before Dec. 31, 2017. Through November 2011, the CRR Skills Test consisted of literary material, just like the CRC Skills Test (the CRR Skills Test is now testimony material). The last opportunity in 2017 to take the CRC Written Knowledge Test is in October. Registration closes Sept. 30. The CRC Workshop is also available online as a package of nine modules. Members who earned the CRR before 2011 and want to earn the CRC by Dec. 31 may watch the online workshop. Our team of instructors knows only too well how quickly technology changes in the world of captioning. But the one aspect of captioning that remains the same is the need to write cleanly and conflict free. The CRC Workshop includes instruction about basic realtime writing for captioning. We cover the need to use prefixes and suffixes along with basic root words. We also talk about the never-ending need to prepare for upcoming assignments. Technology has expanded the field of captioning from TV encoders to the internet. New platforms for online meetings develop every year. Competing caption streaming services bring new solutions that expand our capabilities all the time. Our instructors tried to cover the various methods of displaying our captions with an eye to future developments. The captioning world grows every year, and the demand for qualified captioners is stronger than ever. Our committee looks forward to welcoming more and more Certified Realtime Captioners in the coming year. Carol Studenmund, FAPR, RDR, CRR, CRC, is a broadcast captioner in Portland, Ore., and co-chair of the NCRA Certified Realtime Captioner Certification Committee. She can be reached at cstudenmund@LNSCaptioning.com.